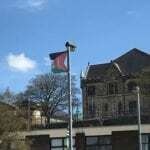 Palestinian and Israeli Flags Over Derry, Northern Ireland? Palestinian and Israeli flags fly over the city of Derry in Northern Ireland. For centuries the city has been a center of tensions between Loyalists who support continued union with Great Britain and Republicans who want a united Irish Republic. Dr. Patrick Fitzgerald is an Irish historian. He says both sides fly these flags as a way to link their political struggle to the wider world. David Shuer has the story.